Robert Clarke, co-author of Cannabis: Evolution and Ethnobotany, discusses CBD-rich drug plants, disappearing landrace strains, and the future of cannabis farming in the United States. In this video Rob Clarke, co-author of Cannabis: Evolution and Ethnobotany, discusses CBD-rich drug plants, disappearing landrace strains, and the future of cannabis farming in the United States. Project CBD: Today we’re talking to Robert Clarke, noted writer and scholar, also director of the BioAgronomics Group. It’s an international consulting firm that services the cannabis industry. Rob is the author of quite a few very interesting books, including Marijuana Botany and, most recently, co-author of Cannabis: Evolution and Ethnobotany, a tome that represents really his life’s work involving extensive travel around the world visiting various hemp cultures, cannabis cultures. Rob, what got you into this? Robert Clarke: Well, I guess it was going to University of California in Santa Cruz in the formative years. Yeah, it seemed an appropriate way to graduate from university—something I was interested in so I wrote an undergraduate dissertation about cannabis. And it’s been my path ever since. Project CBD: Well, I remember back in the day, back in the 1960s, late 1960s, when one spoke about cannabis one heard phrases like “Acapulco Gold,” “Panama Red,” yet when I go into a medical marijuana dispensary these days in California, I don’t see those strains. What happened to those great old landrace strains? Clarke: Yeah, those would be like you say, what we call those landraces. Those were varieties maintained by local farmers in concert with the natural selective pressures of the local environment. And usually selected for a particular end use, whether it was for marijuana or for hemp seeds or hemp fiber. And those were really what the original marijuana varieties were: the imported Colombian and Mexican and Thai of the past. They were the varieties that farmers grew for themselves. Then they became items of trade. And there was never really enough of those to fill the expanding market. So, pretty soon people grew whatever they could get a hold of. They brought seeds from the USA back to production areas like Mexico or Colombia. And, then those landraces began to disappear. There weren’t farmers carefully taking care of them every year, maintaining them. There wasn’t such a selection for quality plants any more. We’ve just basically lost these over the years. Project CBD: And, in terms of the genetic explosion, if you will, starting back in the mid-1970s when people in the States, particularly in northern California, started to breed with these different seeds from different parts of the world—these different landrace strains. These became sort of the building blocks for many of the strains that people enjoy today. Clarke: Absolutely, absolutely. Those genes are still there from those landraces. It’s just not possible to go back and find them in situ any more, living where they used to, in those particular assortments of genes that made that landrace. But those genes are—as you say—they were the basic building blocks, they were hybridized Colombians with Mexicans with Thais, with Indians, Jamaicans, all what we think of today as the narrow-leafed drug varieties. The true indica, the indica from India, where all these originated, whether they ended up in Mexico or not, all these varieties started in the Indian subcontinent. And, this hybridization caused this hybrid vigor, as we would call it. These were isolated gene pools that came together only after people crossed them, marijuana growers in the States and Europe as well, crossed them and made these hybrid varieties that created situations where the best traits of both parents could be expressed. So you’d have large flowers from one parent and early maturation and good resin content from another one, potency from another one. You’ve come together with these poly-hybrid sinsemilla varieties that we have today. They have lots and lots of ancestors, if you will, lots of parents and grandparents and great-grandparents. Project CBD: It would seem that in the process of gaining these hybrids maybe we’re also losing something, if the original landrace qualities, the actual plants themselves are being disrupted by the very diversity they helped bring about. Clarke: Sure. Sure, we’ve become very narrow in what we’ve selected. We’ve wanted plants that had a lot of aroma, a lot of potency, matured early, and gave high yields. A lot of the landraces really didn’t give us that. That’s why we’ve gone on and adopted these hybrid varieties as being our standard these days. But, if you look at—despite all the variety we see between a Kush and a Cookie or whatever, this was really looking at variety amongst a very tiny part of the whole cannabis gene pool. It’s leaving out all the hemp varieties. It’s leaving out a lot of the wild varieties or escaped varieties that are there, unselected types. And we can’t really go back and find the original building blocks any more. So we’re kind of stuck. I mean, the genes are there but they’ve assorted into what’s become popular today. And it’s hard to go back and find an original Colombian to get gene combinations from that plant that we’ve suppressed, that we’ve selected against for the last 30 years. Project CBD: You’ve been involved in assisting a project that entails genetic tracking of strains, the Phylos Project. I believe it’s based in Oregon. Maybe you could tell us a little bit about that. What is that all about, why are you interested in that? Clarke: This is a project based out of Portland, Oregon. Phylos Bioscience is the name of the company. And the project is the Phylos Bioscience Cannabis Evolution Project. The idea here is to characterize genetically, to look at the genome of cannabis, the entire genome, but to look at different examples. We have, for instance, all the dispensary samples, over 1,000, that have been analyzed so far. And they produce—you can look at it as a cluster of data, three-dimensional cluster of data, everything is a bit related to everything else, because of the situation I just explained with the mixing of the basic building blocks. But to resolve this and to show what’s gone into these modern varieties, we’re trying to also find original Colombians and Mexicans and Jamaicans, and characterize these building blocks genetically so we can see how they’re related to the modern varieties. And it makes an interesting experiment from two angles. One is you can begin to see the evolution of cannabis, but we also are able to use this model to test whether genomic analysis, whether DNA analysis, is really applicable to cannabis. Because we know a lot of the history, we know that Jamaicans and Colombians were combined together to make certain varieties. And if this is not shown by the data we’re developing, then we have to re-investigate the applicability of whether this data is really fit for studying cannabis. It’s a very complex plant. It’s unlike most plants, it’s out-crossing. There are male and female plants. So it’s impossible to—nearly impossible—to self an individual for a trait that’s favorable. If you do this, you can do it artificially but it’s not the natural situation. And it’s also wind-pollinated. So that unless you isolate plants to keep them from being pollinated by other ones in the neighborhood, then the pollen blows around in the wind, so one parent, one plant can be a parent to many, many offspring with very many mates. So this is also making for diversity constantly in cannabis. And we, as breeders, fight this diversity by trying to narrow it down to a variety that breeds relatively true. But this is a difficult path. It’s easy to make cannabis seeds, but it’s not an easy plant to breed in a structured way that leads to plant improvement, leads to better varieties. Project CBD: And why is that you have these challenges with breeding? How does the history of the plant itself relate to that? Clarke: It’s basically its natural history—just that it wants to be an out-crosser, it’s always striving for variety in its own survival mechanism, if you will. And we’re trying to narrow that variety so that a cultivar will have certain traits. It will mature in a certain number of weeks, have a certain aroma, and a certain cannabinoid content. It’s always a battle between having enough diversity that the plant is genetically healthy and not terribly inbred, but inbred enough so that it’s not just a dog’s breakfast of different types in one population. Project CBD: It’s an interesting point you make, about how studying the genetics of the plant could shed light on that very process of gene sequencing the plant. Usually it’s sort of the other way around, it’s the gene sequencing that’s going to shed light on the plant. It’s an interesting reversal. But, let’s assume that there’s a correspondence there, it turns out what folks like Mowgli Holmes and the Phylos Project, John Page up in British Colombia, the fellow out in Colorado, and Kevin McKernan out there in Boston doing this very interesting work with gene sequencing the plant. Let’s say, the method is validated. So what are the likely implications of that for the cannabis industry, for example? I mean, it’s a burgeoning industry and it’s all basically based on this plant, at least in theory. Clarke: Right, and people have put a lot of energy into developing what they call varieties, or at least asexually reproducing a cutting, you know making a clonal propagation. And, once you start to be able to identify plants, to fingerprint them if you will (though it’s not a totally appropriate term), but to identify them in a physical way, then you have the ability to protect them. The initial knee-jerk response is, well if I can identify these gene sequences that identify my variety that I’m trying to keep for my monetary gain, then—like patenting any product or any process—you would begin to think about restricting other people from using your intellectual property, your variety. That’s one way to look at it. And that’s the way patent applications and processes basically work. The situation with cannabis is a little bit different because everybody, pretty much everybody, has given seeds or given cuttings of their favorite plants to their friends. Well the minute they do that they’ve put their creation into public domain. It’s like handing out your manuscript to your book without having copyrighted it. That would be analogous. So it is part of the public domain. And, what that means is that most of the cannabis that’s out there now belongs to everybody. It doesn’t belong to any one person. And if someone has something they haven’t released, they’ve kept it proprietary, then it can belong to just them. And when, and if, there’s a system in America to protect these plants, they could be protected. But, it makes a lot more sense rather than fighting to keep other people from using something you have, to just admit that we all have access to all these things and they belong to the public domain, and they can’t really be sequestered and used by one party. It would be what’s being termed “defensive” intellectual property rights protection. You’re not on the offense to try to keep other people excluding their use or license the use of your variety. You’re just saying that it’s everybody’s and no one person can take it and profit from it. And that seems, in the current state of the way things are, to be a more logical way to approach the situation. Project CBD: Although you have a lot of money moving into the cannabis industry now, where I think IP is considered as one in terms of an offensive approach. This idea of defensive IP (intellectual property) is very interesting and as you say maybe more appropriate for the realities of how the cannabis narrative has unfolded in our culture. Then you have this, still the prohibition hanging over everybody’s head. So where do you see the future of this going? What are the implications here? Clarke: It seems to me that we already have models for where cannabis is probably going. We have a boutique wine industry. We have the craft beer industry. People can make their own beer and wine, but very few people bother to do that. They go buy a beer or wine of the price range and quality and varietal characteristics they’re looking for. I don’t see that that would be any different with cannabis. But, like beer and wine, most people drink mass-produced beers and wines. They don’t want to afford the better ones. They’re perfectly happy with drinking whatever they’re drinking, smoking whatever they’re smoking. And I assume that based on convenience and things that a lot of the cannabis industry will be, you know will be the convenience industry—drop by an outlet where whatever it ends up being, a liquor store or a cannabis store or a Speedy Mart or whatever, and picking up whatever product you like, whether it be edible or vape or whatever. It’s harder really to picture what the regulatory climate is going to be for this whole thing. It’s difficult to perceive what the Food and Drug Administration is going to do with a food-drug or a drug-food, “medibles” as they’re presently called. This is just a nightmare scenario for me. It’s that, medicines were the gateway to getting adult social use of cannabis legalized is—fine that’s the path it’s taken—but as soon as legitimate established medical factions, companies, enter into this the whole terrain is going to change. You can’t say something is a medicine unless you can prove it’s a medicine. And, we just don’t have the science in most of these cases to back up what people feel in their hearts is correct. And probably they are right. We have good anecdotal evidence. But we need hard science. On many, many levels with cannabis, we’re assuming a lot more than we actually know. Clarke: And it’s really a health care product. I mean, why make claims. It’s a health care product. If I decide that red wine is good for my heart—which there’s plenty of evidence that red wine is good for human hearts—that’s fine. But I can’t put a label on a bottle of red wine that says “this is heart healthy wine.” That’s where the line is drawn. And we make lots and lots of claims that would not be allowed for any health care product. So a lot of the aim with our consulting group is to try to help people “pre-comply.” It’s easy enough to see on a federal level many rules that people are going to have to comply with, many hoops they’re going to have to jump through—with any product that is a food or a health care product, or anything of this nature. So it’s not so hard to imagine the obvious hoops you have to jump through. What we have to hope for, and also try to enter in as much as we can as a user group and those responsible for our own futures, that we don’t allow cannabis to be over-regulated. It’s not any more dangerous, as it’s turning out, then many other food and drug products. So why, why should we be subject to more hassles than other groups. There’s no such thing as “zero tolerance” for rat poop in peanut butter. You’re allowed to have a tiny bit of rat poop in peanut butter—not enough to make people ill—but you can’t say that you can’t have any rat poop in peanut butter. That’s impossible to achieve. So we don’t want goals with cannabis regulation that would make it impossible to achieve. Project CBD: It seems that, in terms of a prohibitionist framework, those that define, or try to define what that plant is, are very comfortable calling it a drug plant in a prohibitionist context—calling it a drug plant in a medical context it’s begrudging. In the framework that you present in Cannabis: Evolution and Ethnobotany you speak about drug plants and non-drug plants, the latter being hemp. You don’t speak so much about indica and sativa and the way that it’s folklorically discussed in our own community. Why not? What’s the drawback, why not speak in those terms that people tend to be familiar with? You know, they think indicas, or a certain, make you more tired, and sativas energetic. What’s the shortcoming with that kind of way of discussing things? Clarke: Well, I think it’s fine to have these characterizations. And people—what we’re talking about here is the study of classifying organisms, or classifying anything, it’s taxonomy. Every culture has a different way of doing taxonomy. Every tribal group that names the plants they use for food and medicines have created their own taxonomy, in their own language. And often those are descriptive. And those words, through the descriptions, relate one plant species to another that because of their similar uses maybe they’re grouped together by this description. They might not be related in terms of their leaves and flowers and growth habit particularly, but based on their usage. So people have to realize that taxonomy is a very fluid thing. And, of course, it’s valuable to name things because then we have a common system. And when you say you’re talking about cannabis sativa, I know you’re talking about the same plant that I am, not some other cannabis or some other drug plant or some other fiber plant. It’s all very valuable. But, we’ve ended up through sort of a process of elimination, we’ve ended up with calling the two different groups general classes of drug cannabis, it seems to me are either sativa or indica. Well, first of all, they’re all hybrids between two different groups, whatever you want to call them. We ended up with sativas and indicas as the names because up until relatively recently most taxonomists have concurred that all variation of cannabis is part of one species, cannabis sativa. Then when Afghan cannabis came along that was markedly different, that was called indica. And basically to differentiate it from what already existed which was called sativa, and it was a drug variety and there were reasons to think that it was another species. That’s where the two species debate really began is when Afghan cannabis came on the scene, late ’70s. But before that people had only seen drug cannabis that came from India, no matter where on the planet it popped up, it had originated in India. And Afghan cannabis was limited just to Afghanistan and parts of Pakistan until the late ’70s. Project CBD: And did it look substantially different, these two? Project CBD: But they’re both drug plants in the sense that if you use them they get you high. Clarke: Psychoactive drug plants. They both contain THC. The narrow-leaf drug varieties, what people call sativa. The true indicas (indica means from India), and what Lamarck named cannabis indica, that’s what he meant. He meant the narrow-leafed drug varieties from India. And they’re just entirely different from the Afghan varieties, which when they were brought into California, revolutionized the whole sensimilla industry: made plants that were higher yielding, easier to manipulate and manage because they were shorter, and they matured earlier. And they had unique aromas and flavors that people initially quite liked. They’re also very high in CBD. All the hashish varieties have quite a lot of CBD in them as well as THC. On average, maybe about the same amount of CBD as THC. And we’ve basically bred the CBD out of these varieties in our modern sensimilla. Project CBD: And yet, today there’s a lot of discussion about CBD derived from industrial hemp, as if this is—and because of the somewhat arbitrary definition of hemp as being below 0.3 percent THC, that makes it a hemp plant, there is this idea that somehow the CBD-dominant plants are not cannabis, they’re hemp. And, yet when you step back and look at it, a CBD plant with 10, 15 percent, maybe 20 percent CBD by dry weight like with ACDC in California—while it doesn’t get you high necessarily, it’s still a drug plant. So does it make sense to call that hemp when it’s got all that cannabinoid in there, it just happens to be not mainly THC. Isn’t it all just drug plants, as you’d say? Clarke: To me it is. And, their backgrounds are the same too. ACDC and Harlequin and these things, as far as I know—and I’m pretty sure we’ll see in the genetic analyses—they don’t have a hemp heritage. They don’t have European cannabis sativa in them or they don’t have Chinese cannabis indica subspecies chinensis, that’s what the broad-leafed drug varieties or hemp varieties. It’s a different hemp, the Asian hemp. But these are not in the high-CBD varieties. I would suspect that the CBD in those comes from Afghanistan. And they are, they were bred as psychoactive drug varieties. It just so happens that they didn’t get—the baby didn’t get thrown out with the bathwater in this particular case. When analysis began on a public available level a few years ago, people went back and looked at their different varieties and went wow, this one has CBD in it. Far out! They had no idea. No idea at all. And those were psychoactive drug varieties before they realized that they could use them for something else. So of course they’re drug plants. They were bred for drugs. They were selected for high THC. They happened, also, to be high CBD plants, some of them—very few of them. And that’s what we have today is these high CBD drug producing plants, but the end product is drugs. They’re not hemp plants. We’re not eating the seeds or wearing the fibers. So yeah, you have to call them drug plants, non-psychoactive drug plants. Project CBD: To me, that makes a lot more sense. The way that we talk about CBD derived from hemp, what are we really talking about here? If it’s a plant that has 8, 10, 15, 20 percent cannabinoids, whether they be CBD or THC like you’re saying, is a drug plant. That’s what it is. A hemp plant grown for fiber or for the [seed] oil, that’s a different kind of thing. And yet, it’s been blurred, I think, partly because of this green rush toward establishing a foothold in the brave new world of legalized cannabis, such as it is. But, anyway, this has been very interesting. 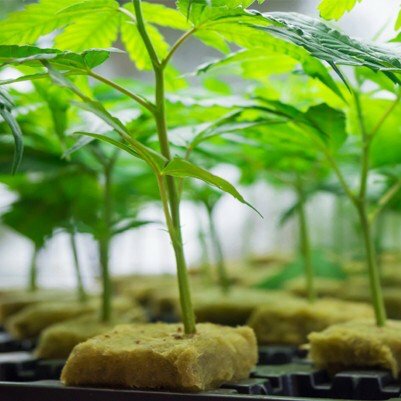 You know your work, going back to Marijuana Botany in the early ’80s, has really been – it’s really mentored a whole generation of farmers who I think these days are in for some interesting changes. Maybe you could comment on what you see in the future for the farmers who have carried the ball in places like the Emerald Triangle doing this kind of breeding, this outlaw farming. What do you think the future holds? Clarke: I think the future for some of these people will be really bright. But they’re the kind of people who land on their feet no matter what. The vast majority of people, I think, are going to be left behind. And, that’s just because we’ve operated in a prohibition setting. You know, the price of cannabis is artificially very high, and that’s because it’s been prohibited. It’s not particularly difficult to grow. It’s easier for the average person to grow now then it ever was. And, people who’ve been involved with this business, especially in California, live in agriculturally marginal areas. They were fine areas for back-to-the-land movements because land was discarded and cheap, left behind by the logging industry. You see where the bottomlands, they’re occupied by wineries that have been here for 100 years or more. That’s where the good land was in northern California. And the back-to-the-landers ended up with the rest. They’ve made an incredible go of it. In a way, unfortunately, cannabis has become a key part of the economic picture in places like northern California. And this can’t persist. There’s going to be way too many regulations for most people to deal with. It’s just simply not going to be worth the trouble. And there will be people who stick with it. They’ll be the boutique growers. But, you know what, a lot of them are probably going to move to some part of the state that’s got better weather, if they’re really serious about it. And it’s sad, but true. It’s the economic settling out of this picture. There’s going to be bigger producers, just like there is for everything. So, yeah. I hope everybody adapts as best they can.